After Roma squashed Napoli 4-2 over the weekend, I couldn't help but think we've been here before. The contours of Napoli's capitulation were familiar. Napoli's defeat, coupled with Juventus's last-gasp win over Lazio, felt pivotal, even decisive in the title race. And, I can sort of predict the aftermath as well. I expect that soon Napoli president Aurelio di Laurentiis will remind everyone of the club's extraordinary achievement despite not being as rich as Juventus. Then he will call the Stadio San Paolo a toilet, and reiterate that the Napoli mayor, Luigi de Magistris, has stymied his efforts for a new stadium. (Perhaps he will spare us musings on more outlandish topics like the hygiene standards of English women). Add a bit of bluster and shots at the power brokers in northern Italy, and a reminder that the Champions League is the only tournament Napoli should be playing in. Then, next year Napoli will exit the Champions League group stage. Everyone will laud them for failing so so gallantly. Coach Maurizio Sarri (assuming he's still there) will moan about how ludicrous the Europa league is. At some point, they will rush back at least three key players from hideous injuries (like they did with Faouzi Ghoulam and Arkadiusz Milik) and two of them will snap some more ligaments. It seems to me that this club hasn't understood that winning engenders winning. They scorned the Europa League--openly, brazenly--only to lose (in all probability) the Scudetto two weeks later. Admittedly, Sarri is a fine coach, whose Napoli team is easy on the eye. My gripe is more that whenever they have had to play a key game in recent memory, Napoli have fluffed their lines (Athletic Bilbao, Juventus, Dnipro, Roma etc.). And that is not only Sarri's failing (Benitez was in charge against Bilbao in the 2014 CL qualifier, for example) but also the club's. Di Laurentiis sets the tone when he privileges one tournament over the other, which I think has harmed Napoli more that it has helped them. But I do have reservations about Sarri the psychologist, motivator, or trascinatore. I am not suggesting that a tub-thumper is what is necessarily required, but Napoli look really unprepared sometimes. The Europa League defeat to Leipzig at the San Paolo was particularly disappointing, albeit predictable. There was no excuse for Napoli to fold like they did against Roma either, especially when you consider there had been no European exertion a few days earlier. Had they won, they would have gone 7 points ahead of Juve, and the Bianconeri would have had to play their game in hand against Atalanta with a lot more pressure. 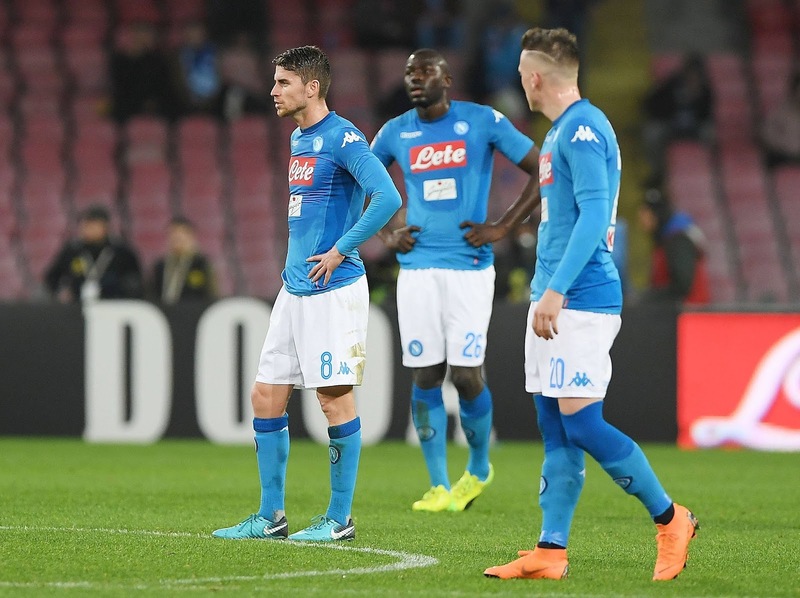 There are some comparisons to be made with the club that brushed aside Napoli at the San Paolo on Saturday. When Roma won the Scudetto last in 2001, Fabio Capello managed all aspects of the team convincingly. You need that type of coach sometimes to break the mould at a club, especially at a club like Napoli or Roma, where the organizational structure and the financial strength have been comparatively inferior to that of Milan and Juventus. During the game Saturday, I thought back to Roma's 2-2 draw against Juventus in the 2000/01 season, when Hidetoshi Nakata scored a bullet from long-range and Vincenzo Montella equalized in the 90th minute. Roma were down 2-0 after just six minutes, but they managed to claw their way back at the Stadio Delle Alpi. That victory kept them five points ahead of second-placed Lazio at the time, but, more critically, claiming a draw in Turin preserved their psychological edge in the title race. There have been no similar moments for Napoli in recent years. Napoli did demolish Lazio 4-1 in February after going a goal down early, but they couldn't overturn Roma. Sure, it helps when you have players like Gabriel Batistuta, Francesco Totti, Montella etc. like Roma did, but Napoli also have a lot of quality, and some players are playing beyond themselves--I'd be curious to see how Ghoulam and Jose Callejon fare outside of this Napoli, for example. I am not suggesting Capello is a phenomenal coach, or that Sarri isn't; more, I have doubts about whether Sarri can finish the job. There are still more than ten games left in the season, but it seems inevitable that Juventus will now win an unprecedented seventh Scudetto in a row.